This cool black and white squirrel is doing some extreme skateboarding. Available for men as a plain white tee and a ringer tee, you can buy this shirt here (plain), and here (ringer). When Old Ruffly Fur gets on his board, there's no knowing what he's going to do next. He's a cool squirrel. And he's not just your every day squirrel on a skateboard; he's got some extreme skateboard moves. With paws like that, he doesn't need skate shoes. He's still putting safety first, though, with those rad knee pads and elbow pads. Because even squirrels like Old Ruffly care about safety. 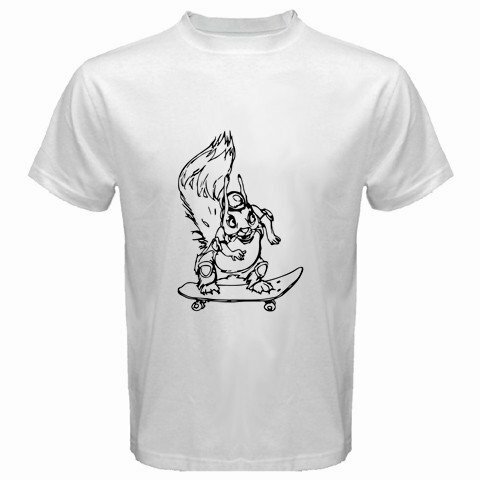 If you're looking for a funny squirrel shirt and you like to skateboard, this shirt's got your name on it!